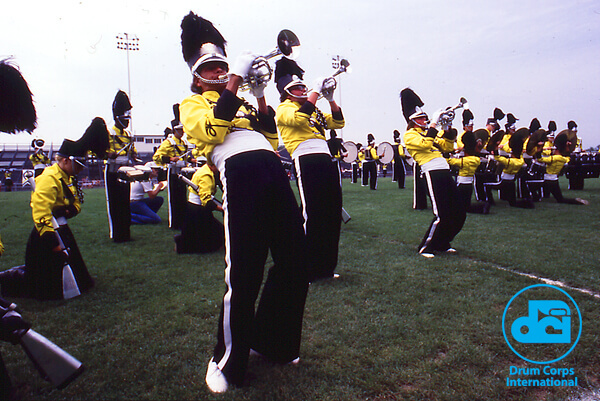 A merger of two Canadian corps, the Seneca Princemen and the Toronto Optimists, the Seneca Optimists competed at the Drum Corps World Championships from 1976 to 1978. In 1976 the corps helped establish an interesting piece of DCI trivia. That year is the only in DCI history in which two corps from the same city have competed against each other in the Finals, doing so with fellow Toronto corps the Oakland Crusaders. Repertoire for the 1977 Optimists included, Mahler's Seventh Symphony, "Children's Dance" from Merry Mount Suite, selections from West Side Story and others. Read more about the 1977 Seneca Optimists.